This picture is an illustration from Russian governmental social site http://deti.wwwerh.ru/ which deals with different family issues. It looks ok – like a simple family, with lot of kids etc. But people noticed that it’s an exact copy from the poster of Nazi Germany. Look on the photo below – that’s a German propaganda poster which was used widely during WW2, appealing to Racial dominance of German White Race. And some more weird stuff: Russian illegal dog fights. And for all HDR lovers – more beautiful HDR shots from Moscow. This is just another clumsy attempt at propaganda. I searched for омс россии and got nothing. Just some construction agencies and stuff. 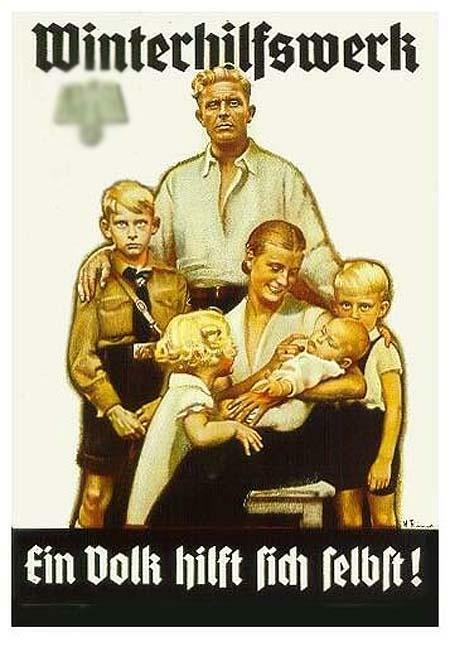 Russia DOES need more birth rate, but you must be a fool or an American to believe they would rip off a NAZI poster. I though that Putin announced legislation that provides women with extra income to have children. The incentive is being given because birthrates have declined rapidly. Not only does the Russian poster look bogus, but the Nazi poster from which it has been copied is NOT about “racial dominance of the German white race”…it’s about Winter Relief. The Cold War is still with us! The same happend in Germany some time ago. Hey Nazism!!! Welcome back in germany!! What does the first image say? Yes, and the two little boys look all “Village of the Damned” on both posters. Hey ladies: find a psycho and breed some scary babies! I think that the father on the Russia versions looks black or possibly Muslim. And this is Wal-Mart selling a t-shirt with an SS skull on it. Weird. Sorry, in this poster is no racial dominance. You are right that Winterhilfswerk is a charitable program “Winter Helping Works” or “Winter Welfare Organization,” but odds are they only helped a specific population. Please provide a link to the source of this image because it looks like pure bs. I couldn’t find it. 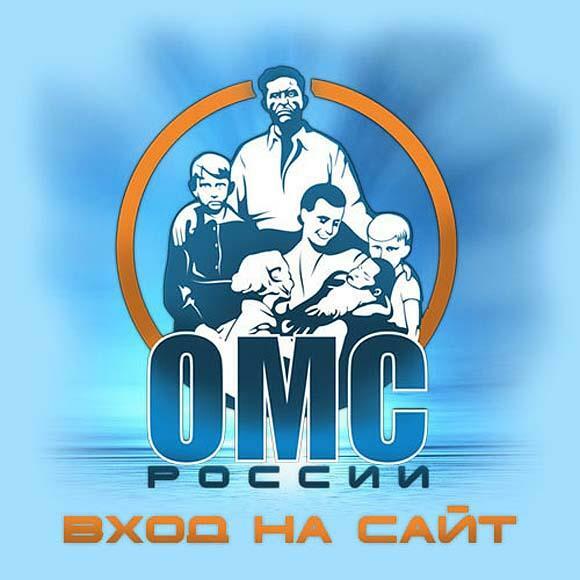 ОМС most probably means “обязательное медицинское страхование” – “compulsory medical insurance”. Here’s the official OMS fund site: http://www.ffoms.ru/ffoms/ – it has nothing even remotely similar to that. May be smb would notice that it is not a site at all? It’s only a proxy, may be a draft, created by some web-designer. You are quoting this ridiculous example of individual`s ignorance as an example of political course of country? yes. IT IS A GOVERNMENT website. The government charts the course of the country. The old communit regime is back and ready to crack down on its people. It is empty and was probably made by a person who does not speak good russian. Good job on not getting a proper translation or the cultural context. You are just repeating propaganda mischaracterizing both Germans and Russians. How does that help anyone? It’s fine if you want to have ignorant hate towards others, but please don’t accuse innocents of the same. Не поленился сходить на этот самый deti.wwwerh.ru/, рассказываю. Это не сайт государственной организации. Это вообще не рабочий сайт, а заготовка. Он выложен на поддомене дизайнерской конторы. Откуда дизайнеры повзаимствовали эту картинку остаётся только догадываться… Судя по остальным картинкам, из клипартов и халявных сборников. The German poster is interesting in that the males are all looking at the viewer while none of the females are. Also the adult male has the most intimidating stare and is the most “at-ease”. As you go down in age the stares are semi intimidating as well as semi curious (sort of like they’re building exactly into their dad). Well, the women wouldn’t fight in the war would they. So it’s as if the poster is beckoning the men, leaving the women to what they do best, making babies. @Kevin: f found your insights beautiful. i didnt really LOOK at the picture that way. Seriously, that’s just a graphic designer looking for a picture to illustrate on the internet and he found that one which is quite fitting. Maybe he didnt realise it was a Nazi propoganda poster? It wouldn’t be that easy to know that fact unless you researched it. I think that site is a joke about Putin’s birthrate policies. Everyone knows that if Russia just wanted more people, period, they could open up the borders to Tajiks, Uzbeks, and Kazakhs, who will have babies without getting paid, but they don’t. Instead they are paying- knowing that it will not change the birthrate of Russian Muslims, but possibly encourage Slavic Russians. I am pro-immigration but even I can understand this policy. It’s much better than kicking out all Central Asians- after all the Russian policy towards Tajik workers is still a million times better than the American policy towards Mexican workers. Elizabeth, it is very dangerous with immigrants. They bring with themselves new language, new religion, new culture. It is possible to have a new Kosovo from where the serbian people were finally kicked out with the help of NATO. But of course money will not help much. In Europe people are quite rich but the birthrate is very low. On the contrary, people in Russia had very many children in older times, also right after WW2, when the economical situation was more difficult than now. There must be changed something in the moral of society. Anna- Yes, I am not saying Putin’s policy is a bad one. I support it. However Islam is not new to Russia- it has been a part of Russia for centuries. Tatarstan, for example, was Russian. Even Rakhmaninoff (Rahmon, from Bismullah RAHMONI Rahim) was from a Muslim Tatar family that Russified itself. And in Kosovo, this is different because those people were living side by side. Neither Albanians nor Serbs were immigrants in the same way as Caucasians or Asians are. If Russia wants to keep out immigrants it will be in the same position as the United States, France, Sweden, Japan, and all other rich countries. No complaints from me. Root says (translated) that it is not a site from the organisation. “Winterhilfswerk” literally means “Winterhelp”foundation”” (“Werk” in this case means that people gather to help). “Ein Volk hilft sich selbst” means “A Nation helps itself”. Now where does this appeal to the dominance of the german white race? This one just got digged. Congrats again to our great moderator! I’m in the New Media field, and I see this sort of thing from time to time. It’s called plagiarism. The artist for the Russian site was probably too lazy to do anything on their own and decided to put a spin on another’s work. Plain and simple. I just read an article about Russia falling more and more fimly into the grip of neo-nazism. How last year, there were 54 racially motivated murders – about 1 per week. This year, there had been seven by the end of January. How Moscow’s mayor had ordered all Caucasian-looking (not in the American sense of the term) people off the city’s open-air markets, which only resulted in markets becoming devoid of ANY people and goods. How a government official claimed that in no area, concentration of foreign-looking people should exceed 20%, because it could make native Russians “uncomfortable”. How last year, there were government-sanctioned mass deportations of Georgians from Russian cities. What makes this especially ironic, in addition to being plain sick; is that Russians (just look at the comments on this site) claim to be the great liberators who rid the world of the horror of Nazism. continue listening to mass media and let it wash your brain totally… good luck! How many times have you seen the Mona Lisa reused for another artist’s needs? The Venus de Milo? How about the former Soviet Union’s distinctive hammer and sickle? You can find examples of ‘plagiarism’ like this everywhere. The only difference I see here is that the art used was 60 years old, not 600. IMHO I don’t see anyone looking at the Russian rehash and seeing a plea to breed and breed their race purely. That’s barely visible int the original without the context of being in Germany around 1939-1945. And in the copy I see a man or woman who has no time to paint for hours and make their own ‘proud family portrait’ just to make a clickable button. That would make the Internet either an expensive or boring place to be. Like it or not, ‘plagiarism’ is what Photoshop does best. Hmm, does this mean Gladiator is a Nazi movie because it reuses some of Leni Riefenstahl’s imagery from Triumph of the Will? What a surreal debate, does anyone seriously think Russia would want to be paying homage to the Nazis? Don’t you muppets realise the Nazis killed 20 million Russians? 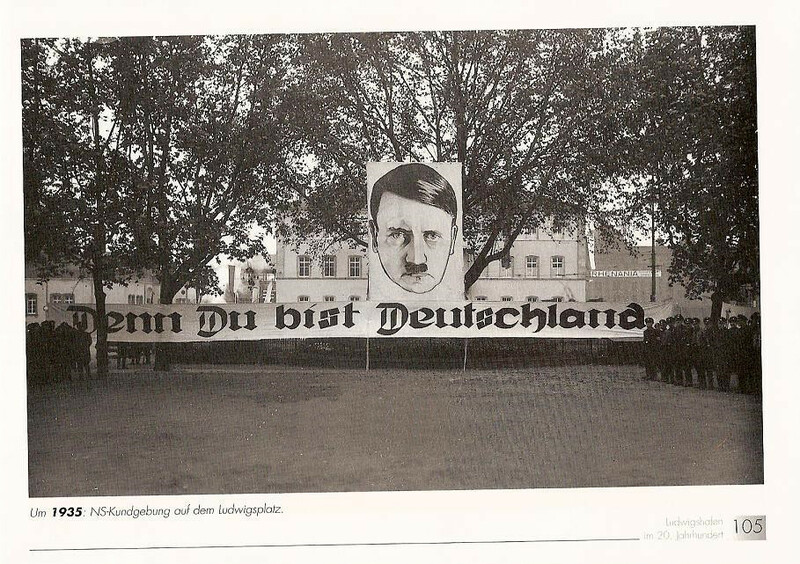 National Socialism didn’t exactly endear itself to the country. Coming from a Jewish Background I can Say, that Jewish people have much more freedom and better standards of life and opportunities now, than they ever did during the Yeltzin years, not to mention the soviet days. However, I can see that racism and anti-Semitism increases in Russian. And Russian government must introduce tougher laws to combat this problem. Ты неграмотное, тупое, отвратительное животное. Как раз из за таких мразей как ты во всём мире не любят русских. if you pay attention to the news you would know that putin is ex KGB. if russia goes anywhere other than free market it will be communism. yes there are “nazis” in russia just like any other country. they are not in power. they are mostly street gangs that dont care for the new wave of 3rd world immigrants into russia. and i dont blame them one bit as the common people have no say in immigration policies (as in every other western country)…its sad. but that breeds anger and then you get violence. Let me set the record straight Hitler was a crazy people no ofence. The Nazi was not a good example hateness is not a good idea. All humans were created equal first all human has the same color of blood it is red we all know that.Second all humans are born from their mother. Third all humans have something in common but we all know we have different color that’s just the way we were created but it doesn’t make a difference we are all humans. And all humans deserve respect. If I was Hitler I would not tell my soldiers or convinced jews to be destroy I would help my poor people from Germany and making our country a better place for everyone Adolf Hitler never knew what he was missing and I’m pretty sure god did not appreciate what Hitler did. God said you shall not kill and take your enemy as a friend and forgive them. I think don’t follow nazi bad example. It’s better to be united working as a team maybe someday the immigrant pherhap’s someday one of them would make your country a better place he or she might invent something useful for everyone or might invent a medicine to cure an uncurable illness nothing is imposible. Maybe oneday he or she might invent a new tecnology. Every human has a special gifth and might make your country better place for everyone. Just like our country a people named Alexander Graham bell he was born in England he came to the united states and he was the first people to invent the first telephone his invention was useful and make our country better country not just for our country also from around the world. A second example an african American he was the first inventor of the first traffic light not just for our country but now almost all around use it as well his invention helped alot for the future generation.